The SA4305A is an accurate three phase power/energy metering integrated circuit providing a single chip solution for three phase energy metering. Very few external components are required and the SA4305A does not require an external crystal or voltage reference. A precision oscillator and a precision voltage reference to supply the circuitry with a stable frequency and stable reference currents are integrated on the chip. The SA4305A metering integrated circuit generates a pulse output, the frequency of which is proportional to the instantaneous active power consumption. 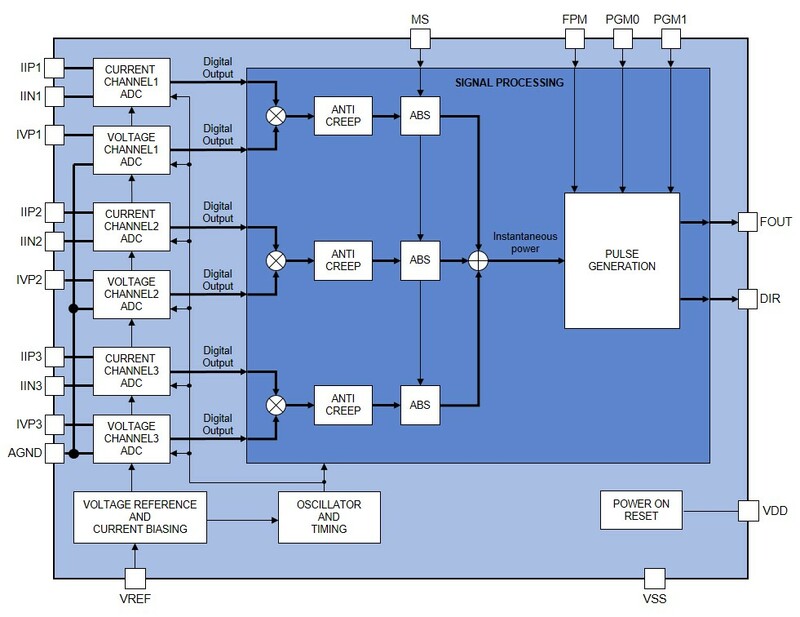 The pulse output is intended to interface with a microcontroller or similar pulse counting circuitry. The SA4305A includes an anti-creep feature preventing any creep effects that affect meter accuracy under no-load or missing phase conditions. The SA4305A integrated circuit is available in a 20 pin small outline (SOIC20) RoHS compliant package.